Back in the 1970’s, there were no wolves in the state of Wisconsin. A bounty on the animals had lead to years of hunting that pushed the remaining wolves out of the state. This was bad news for wolves but good news for the livestock managers who had to compete with wolves for their livelihoods. 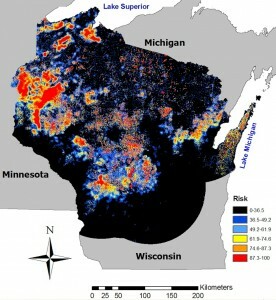 Today, federal protections have made it possible for wolves to trickle back into Wisconsin from neighboring Minnesota. According the Wisconsin Department of Natural Resources, the gray wolves (also called timber wolves) numbered around 700 in 2010. With wolves once again howling in the forests of Wisconsin, livestock managers are looking for ways to protect their animals. Luckily, there’s a new tool that can help predict attacks. 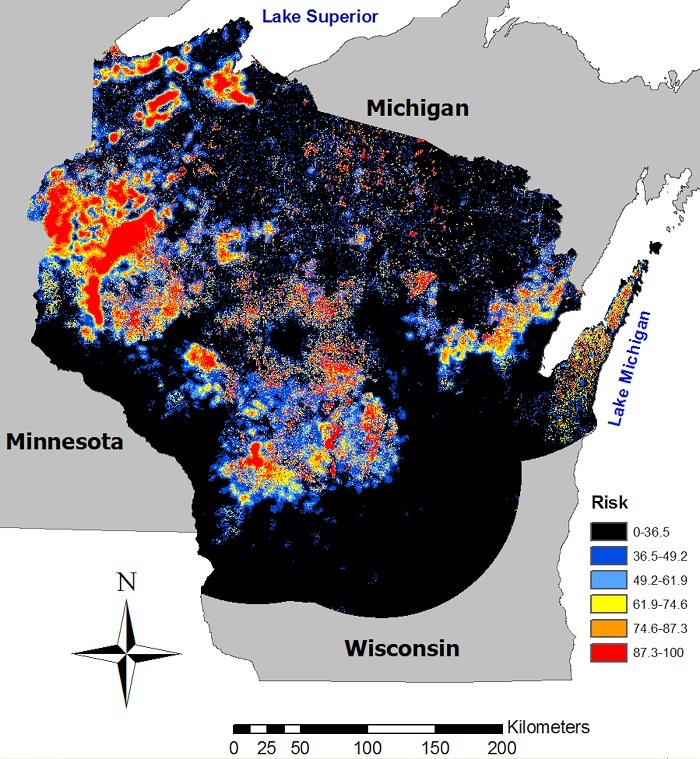 Dr. Adrian Treves, assistant professor at the University of Wisconsin-Madison and founder of the Carnivore Coexistence Laboratory, used seven years of wolf-attack data to create a map of the state that pinpoints high risk areas. His research, co-authored by Adrian Wydeven and Jane Wiedenhoeft of the Wisconsin DNR and Kerry Martin of UW-Madison, appeared alongside the map in the June issue of the journal BioScience. Treves said this map of risky areas is helpful because the popular method of stopping attacks, killing the wolves, isn’t effective. Treves created the map by studying wolf pack presence, landscape and human activities in areas with animal attacks between 1999 and 2006. He and his team used that data to predict attacks between 2007 and 2009. They then looked at the actual attacks during those later years to see if their predictions were accurate. Turns out their predictions were correct 88 percent of the time. After finishing the study, Treves has some advice for livestock managers. He said that though wolves use forests to take cover and rear young, livestock living near forests are not in as much danger as livestock living in farther-away pastures. No one quite knows why that is. Treves thinks maybe wolves in forests are more likely to eat deer, or maybe livestock standing in the middle of fields are just more visible to wolves. “It’s those farmers in that mixed agriculture and forest area that are at most risk,” he said. Treves said risk maps won’t stop wolf attacks, but focusing attention on high-risk areas could help farmers make better management decisions. Farmers will be able to tell if they are in low-risk or high-risk areas and decide if protective measures, like electric fences, are a good investment. “Prevention necessitates prediction,” Treves said. With the wolf population growing in Wisconsin, Treves also encourages farmers to consider the rarity of wolf attacks. Treves said attacks on livestock are carried out by a minority of the population, and only 20 percent of packs in the state are “problem packs.” Killing wolves that attack livestock is also ineffective because very few wolves are involved in repeat attacks. Treves hopes to expand the map to different states and other species, like bears or coyotes. A marketing plan should answer the questions of what, when, how and where you plan to market your cattle. I like the first habit from Steven Covey’s book, The 7 Habits of Highly Effective People: begin with the end in mind. What is the end product you plan on producing? Is it a calf weaned on the way to market when some cash is needed? Is it a weaned, preconditioned calf to be sold in a special sale? Is it a backgrounded short or long yearling? Is it one or more registered animals to be sold to other registered breeders or commercial producers?